About ARTAS - The Hair Restoration Specialist...... Tom Rosanelli, M.D. The Hair Restoration Specialist...... Tom Rosanelli, M.D. ARTAS™ real patients and before and after photos. "I have an amazing hairline and feel confident again. I could not be happier with the results"
The ARTAS Robotic Procedure was designed with you in mind. Developed with leading hair transplant physicians and researchers, this state-of-the-art technology was created to eliminate the guesswork and fatigue associated with manual handheld methods, along with the scarring, complications and downtime of existing invasive surgical techniques. This FDA-cleared, physician-assisted technology provides permanent, natural-looking results without the plugs, pain and stitches associated with traditional hair transplants. The ARTAS Procedure is minimally invasive and does not leave a linear scar, so you have the freedom to cut and style your hair the way you like. Real ARTAS™ Patients. Real ARTAS™ Results. ​with you, the patient, in mind. An important question patients seeking a hair transplant procedure ask is “How will I look after my procedure?”. Up until now, you could only imagine how your results would look and cross your fingers. Now, with the introduction of the groundbreaking ARTAS Hair Studio technology, you do not need to wonder any longer. 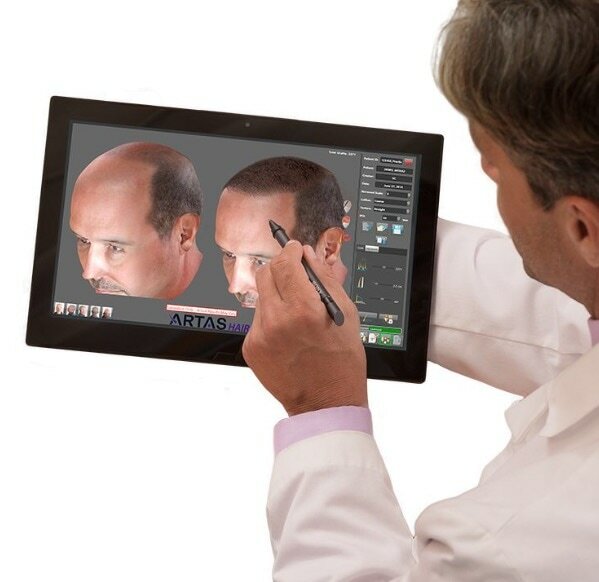 During the consultation, your physician will use the ARTAS Hair Studio technology to create a customized hair transplant design as a 3D model based on your personal photographs. Different aesthetic outcomes require different graft numbers, distribution and placement of your transplanted hair. Using ARTAS Hair Studio, you will see the optimal number of grafts and hairline design needed to meet your expectations. No guessing is required. Together you can make a decision based on your needs and your physician’s recommendations. Minimally Invasive Robotic Harvesting is a state-of-the-art, proprietary hair transplantation advancement available exclusively with the ARTAS Robotic Procedure. ARTAS Artificial Intelligence™ algorithms are used to identify and select your prime hair for harvesting, while maintaining the appearance of your donor area – all under the control of your physician. 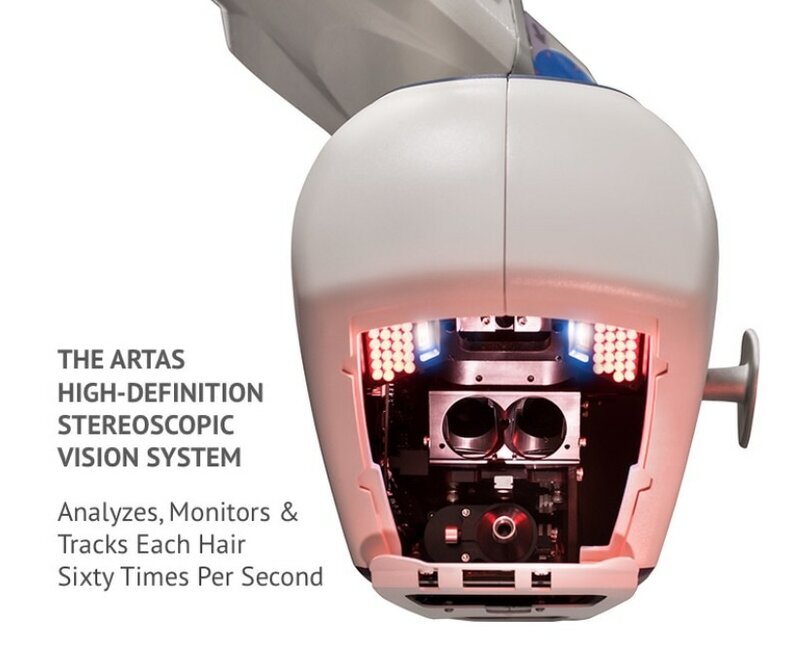 These capabilities are available only with the ARTAS® Robotic System. Other hair transplant techniques cannot offer these highly sophisticated technological advancements. 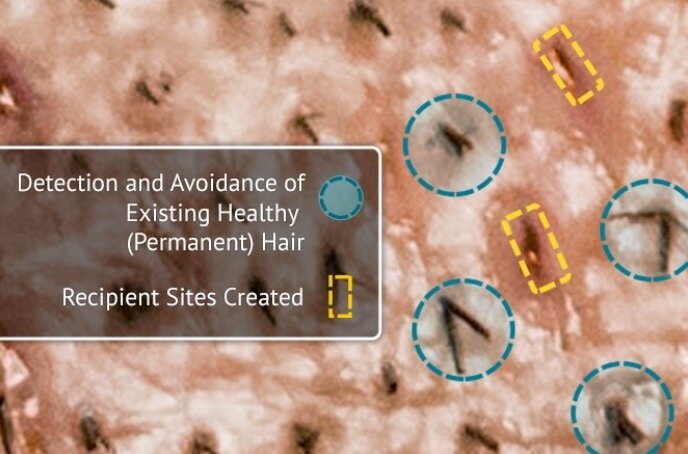 ​A critical area on your head to consider is where your hair is being harvested from. This is called the donor area and consists of an area on the back and sides of your head where hair is not affected by the hormone that causes male pattern baldness. This is permanently growing hair and when transplanted to your balding areas, continues to grow as it did before it was transplanted. It is important to ensure your donor area will look unblemished and your harvested area will look undetectable. Your donor area is just as important as your transplant area. 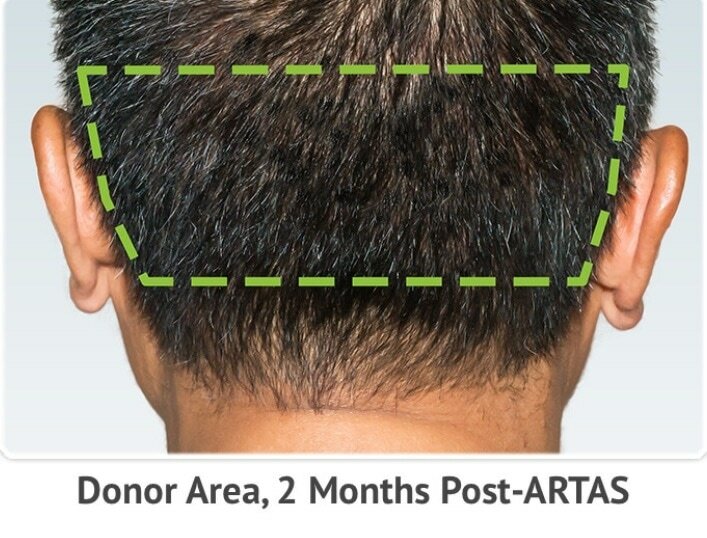 After your hair grows in where it was trimmed for your ARTAS® Robotic Procedure, your donor area should look intact and undetectable. A long scar or patchy looking donor area is an undesirable giveaway that you have had a hair transplant. You want your outcome to look undetectable. Your friends, family, loved ones and business associates should just think you look better, revitalized and more refreshed, without your procedure being obvious. ​The good news is no. Once hairs are harvested, they are then implanted into the balding or thinning areas of your scalp. The appropriate placement of these hairs is essential when striving for an artful aesthetic result. Your physician uses ARTAS Hair Studio® technology to build your recipient site making treatment design. 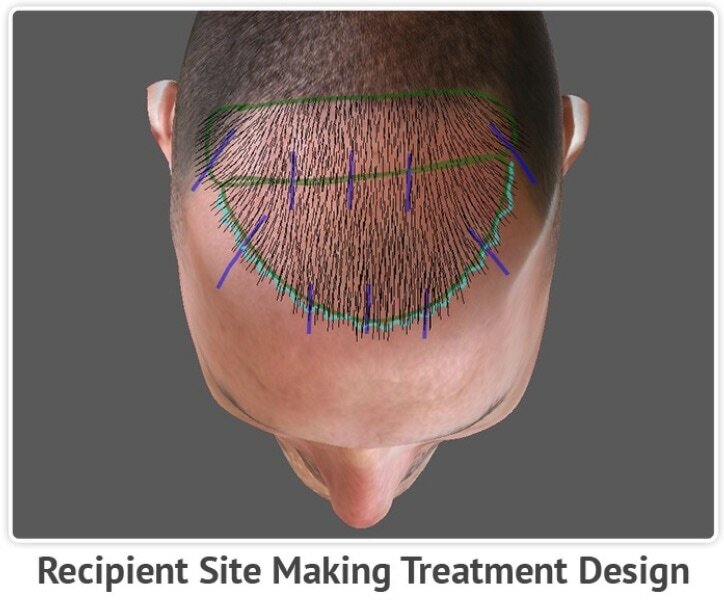 That treatment design is then transferred to the ARTAS® System to deliver your Recipient Site Making pattern. Survival and growth rates of the transplanted hair depend on the meticulous creation of these robotic recipient sites. ​​The ARTAS System identifies both existing healthy (permanent) hair as well as miniaturized/vellus hair to create the best possible aesthetic outcome.